Join our two or three month volunteering programme where you will be based in the Umbrella community in Kathmandu, Nepal. As a volunteer, your role will be to provide assistance to our small but dedicated Nepali and International team. Research Assisting with existing research projects, or conducting your own related to alternative care, trafficking and child protection. Sponsorship Coordinator Collecting data, compiling information packs, updating profiles and supporting email correspondence. Media Coordinator Taking photos for marketing and profiling purposes, writing articles for the newsletter and updating social media and the blog. Workshop Assistant Occasionally assisting or arranging workshops for the Umbrella youth, depending on their school/college timetable. It is very important to us that volunteers gain an understanding of Umbrella’s background and projects, the context of development in Nepal and become aware of the need for responsible volunteering practices. This will not only enrich your experience but will ensure your contribution is ethical and worthwhile. Therefore, learning opportunities are facilitated before, during and after a volunteer’s placement. In preparation for their stay, detailed information packs are sent to volunteers and, on arrival, they receive a comprehensive induction on the work of The Umbrella Foundation as well as the culture, customs and language of Nepal. Every volunteers daily routine will be different based on the skills they bring and Umbrella’s needs at the time. To ensure the well-being of volunteers, you must take at least two days off a week, usually Saturdays and Sundays. Your health is very important to us and you are no good to anyone if you are tired or sick! Lizzi (AUS) and Michael (USA) leading a workshop on case note writing for our field staff. 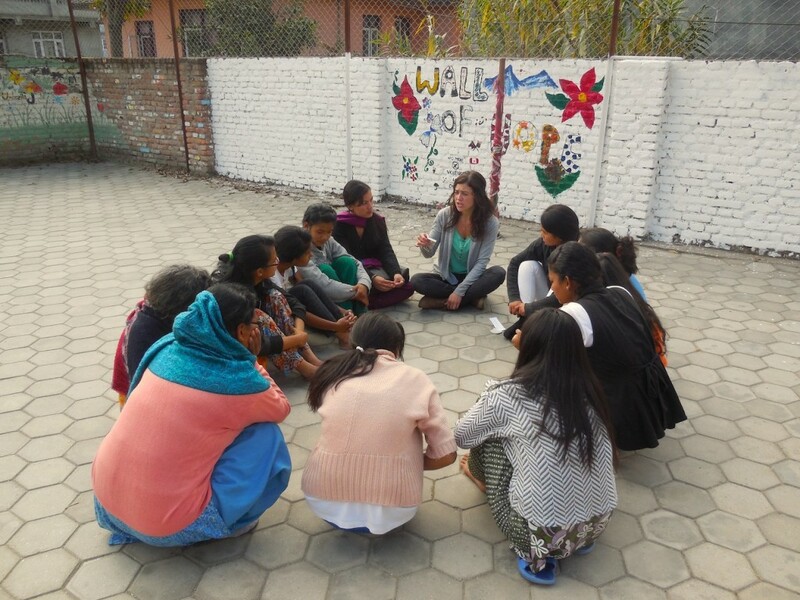 Lizzie (UK) leading a group discussion on girls' rights in Nepal. Volunteers hard at work in Umbrella's office. Before visiting Nepal I had a million and one questions; Who would I be working with? What kind of work would I be doing? How much time would I be spending with the children? Imogen told me the best way to approach the situation was to have no expectations and I think it was the best advice I could have been given. After that, everything that happened while I was here was like a pleasant surprise. The work varied from day to day and I had the opportunity to help out on a broad range of jobs while also gaining great insight into how a small NGO operates. The best thing about the work here is that I had the opportunity and the freedom to apply and share my own knowledge and skills as well as getting to learn from others. I created a digital strategy for the Foundation, a fundraising pack for future volunteers and a video to celebrate Universal Children’s Day. I also designed an Internet safety workshop and held mock job interviews for the youth in the Next Steps programme. The variety from day to day kept things interesting and exciting. Having Dahl Bhat with the girls of Gauri Shanker every week has been a real highlight for me. The girls are so fun-loving, confident and kind. Their enthusiasm is infectious and there’s certainly never a dull moment! I believe this is a credit to Umbrella, their firm stance on ethical volunteering and continuous pursuit of the best lives possible for the children they support. My time in Nepal has surpassed all expectations and the main reason for that has to be the staff here. I have never met, and likely never will meet more kind-hearted, thoughtful and caring people than those I have met working with Umbrella. What once seemed like a daunting trip; my first time travelling alone and my first time volunteering, very quickly changed and I felt immediately welcome and among friends. I have read many testimonials that endorse volunteer programmes on the internet. As such it can be a daunting process trying to choose which one will suit you best. One of the main reasons I decided to do a placement with the Umbrella Foundation was due to their devotion towards ethical volunteering. Many travel companies market themselves as volunteer agencies when in actuality their primary objective is to make a profit from voluntourism (a mixture of volunteering and tourism) rather than directly helping society. During my internship I really got the sense that I was here to assist, even in a small way, in their commitment to help children that have been the victims of human trafficking and injustice. I am very much impressed by Umbrella’s current projects which focus on supporting and reintegrating its children and young adults back into their local communities and its determination to provide them with the relevant life skills to work and continue their education. As such its central ethos is one of sustainability driven by long term goals and initiatives. When I reflect on my time with Umbrella, it surpasses any expectations i had before leaving. My experience has been entirely genuine and I have been given an invaluable insight into how a small NGO operates. The internship itself did not adhere to a strict guideline and I was able to work on a wide array of roles ranging from creating a video project to running workshops for the children which covered topics such as ethics and Japanese food. In this sense the NGO placement was designed in such a way that i could share what knowledge i have and use this in respect to my work there. It also gave me the opportunity to discover so much about the culture, language and customs by talking to the Nepali staff members who welcomed me with open arms and top notch ‘jiskeko’ (banter). Furthermore, the office and volunteer house is situated outside the main touristy part of Nepal so i felt more immersed in the local culture, not to mention the views were something special, especially in the evening. I would recommend this to anyone with an interest in global injustice, development, social work and more broadly politics. Situated in a safe and (relatively!) quiet area at Swayambhu, we are next to the Monkey Temple, a famous world heritage site. This western suburb of Kathmandu is abundant with shops, restaurants, cyber cafes and street vendors. It also borders the Ring Road which circles the city, making it easily accessible by local bus and only 10 minutes by taxi to the bustling inner-city tourist hub of Thamel. As the workload of the team doesn’t stop all year round, volunteers are welcome to join at any time. That said, our programme fills up rapidly (maximum 3 volunteers at one time) so we ask that applications be sent as early as possible in order to avoid disappointment and to allow adequate planning and preparation for your placement. We have a two-month minimum stay (8 weeks) which we feel offers a stable, consistent environment and allows you to get a good understanding of our charity, the local culture and ideas of development in Nepal. We do appreciate volunteers that wish to stay for 3 months also. 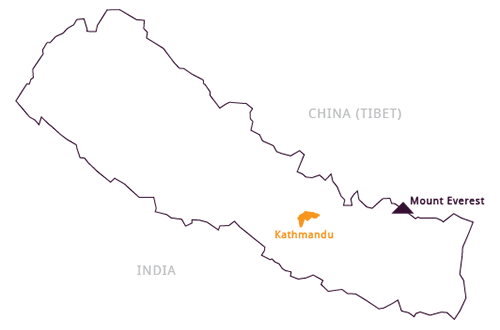 Umbrella is financed entirely by donations, sponsors and fundraisers hosted all over the world. We ask volunteers to fundraise a minimum of €1,500 before coming to Umbrella, to covers some of your expenses while on the programme such as the accommodation in a nearby guesthouse. The remainder of your fundraising also goes towards supporting the education, wellbeing and healthcare of the reintegrated children in our program, the monthly scholarship for the NSEP Umbrella Youth so they are able to live independently while they engage in further study, and the children in our foster care program. We appreciate that as a volunteer you will be giving of your valuable time, but we also ask that you fundraise so as to raise awareness of our work internationally and provide much-needed funds to sustain our projects. Upon arrival, you will receive an induction which includes a detailed introduction to Umbrella, local culture and customs, an overview of ‘orphanages & voluntourism’, a basic Nepali language class and a tour around the area. The Communications Director is the link between the office, the local staff and the volunteers, and is available regarding any problems throughout the placement, or to address any basic questions you might have. Umbrella has an open-door policy, so you are also more than welcome to come to the international staff with serious issues or concerns. Please read the Terms and Conditions and Comhlamh’s Volunteer Charter before applying. Fill out the application form below, giving as much detail as possible to allow us assess your background. Qualities such as motivation, enthusiasm, flexibility, patience and kindness are most important. It is okay if you do not have much experience: we still want to hear from you. Your application will be reviewed as soon as possible and you will receive an email notification acknowledging receipt of your application. Once you have confirmed your interest, you will be prompted to take various steps in order to reserve your placement. To confirm this reservation, we require a deposit to be made at least a month before the date of commencement. Note: If you have any difficulty submitting your online application form, please send an email to volunteers@umbrellanepal.org for an email application form. Apologies for any inconvenience! Note: For applicants from Nepal, we kindly request that you contact the Programme Director of our Nepali Staff, Mr. Tsewang Lama (tsewang@umbrellanepal.org). In your email to Tsewang, please attach your CV and a cover letter, outlining why you would like to get involved with Umbrella. I agree to raise €1,500 to take part in this programme.